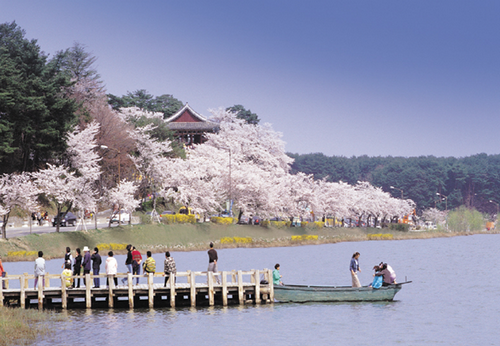 The annual Gyeongpo Cherry Blossom Festival takes place at the center of Gyeongpodae Pavilion, the 6th regional tangible cultural treasure of Korea, when cherry blossoms on trees on the 4.3㎞ path around Gyeongpoho Lake are in full bloom. During the festival, various cultural events and flower exhibitions are held against the backdrop of the beautiful cherry blossom-covered Gyeongpodae. From Gangneung Intercity Bus Terminal or Gangneung Express Bus Terminal, take Bus 202 and get off at Gyeongpodae Bus Stop.